This is an amazing time-lapse video of Yousemite National Park. This video is a collaboration between Sheldon Neill and Colin Delehanty. All timelapses were shot on the Canon 5D Mark II with a variety of Canon L and Zeiss CP.2 Lenses. Posted in Popular Photos on March 5th, 2012. No Comments. This is a very nice time-lapse video capture using an iPhone 4S. Posted in Popular Photos on February 25th, 2012. No Comments. These fantastic photos were taken by photographers working for Office of War Information (OWI), a US agency responsible for supporting war efforts during World War II. 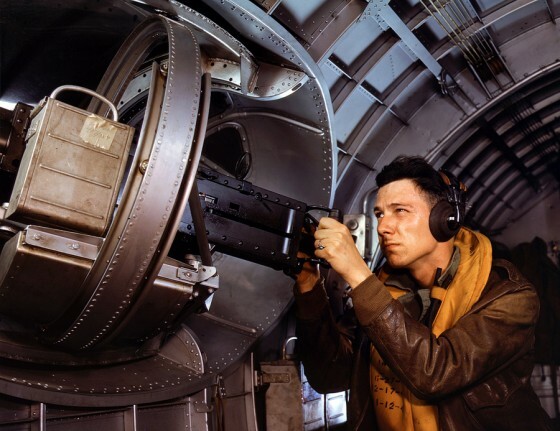 The photos, captured on 4×5 Kodachrome transparencies, depict subject matters such as military preparedness, factory operations, and women in the work force. 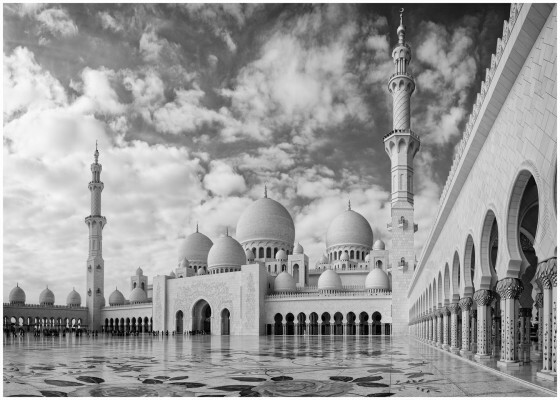 This stunning set of black and white photos of Sheikh Zayed Mosque were shot using D700 with 14-24, 24-70, CZ 2/35ZF.2 and 70-300VR by Phil Page. The lack of color in the black and white (B&W) photos actually makes stronger visual impact. The B&W representation is certainly appropriate for the great architectures of the grand masque. Color versions of the photos can be found in Phil’s portfolio. Also check out this 39-shot HDR panorama in black&white and in color. The carpet in the hall is said to be the world’s largest with over 60,000 sq ft area. Posted in Popular Photos on February 20th, 2012. No Comments. Posted in Popular Photos on February 2nd, 2012. No Comments. This is definitely a new comer in the crowed photo sharing site circle but it offers something nobody else seems to have: Photo that talks! Posted in Popular Photos on January 12th, 2010. 1 Comment. Part of the reason for Flickr’s enormous popularity is their open API that supports a large number of so-called Apps, which are third party software that make your flickr experience more fun and useful. In the past, there was no centralized location for Flickr Apps. Users had to look for them on the web. Developers had to promote their apps using their own websites. It all changed yesterday. Flickr has made a home for these third-party apps called App Garden. The App Garden does not automatically list all the apps created using Flickr API. Developers have to submit them. There aren’t many apps there yet one day after its launch but we can be certain it will change soon. You may want to check out the five cool apps picked by ReadWriteWeb. Posted in Digital photography, Popular Photos on November 4th, 2009. No Comments. Nikon conducted research by polling people and found out that consumers love to share photos (Is that really a surprise?). In the digital age, the smallest scale of sharing is perhaps crowding around the camera’s LCD screen. The 2nd scale is sharing photos on a TV screen or on any appropriate surface using the Nikon Coolpix S1000pj with a built-in projector. The largest scale of photo sharing is sharing online, which profoundly overcomes the limit of time and space for photo sharing on an unprecedented level. The proliferation of social networks and increasingly powerful search engines mean that once a photo is shared online, you may never have the complete control on where the photo may end up. Due to the nature of online sharing, it potentially has more impact. They are really nothing more than common senses, but the five rules for sharing photos online (Photo Netiquette) published by Nikon are good reminders. Posted in Digital photography, Popular Photos on September 29th, 2009. No Comments.